If you’ve ever wanted to master 3 card poker or just learn how to play for fun now you can! Find everything you need to know about this classic casino game’s rules, payouts and winning strategies in our complete 3 card poker guide! What Is Three Card Poker? Three Card Poker is also known as Poker Three and Triple-Card Poker. The game can be played in two parts or variations; the Play/Ante game, where you play against the dealer, or Pair Plus, where you wager on whether you will get a pair or higher. During the Ante Bet, you will need to place a bet on whether your hand will have a higher value than the dealer’s. To evaluate the odds of your hand winning you would also need to know which hands are most valuable. The following table covers the basic hands of three card poker, which you may recognize if you’ve played any other poker games such as video poker or Texas Hold’em. Some casinos require that an Ante Bet be made to bet during the Pair Plus portion of the game. You can find more information on the rules of three card poker in the next section. The rules of three card poker are incredibly simple, whether you’ve ever played at a poker table or not. Now that you are familiar with the hands in three card poker, the next step is to understand the rules and bets you can make once you start playing. The player will initially make an Ante and/or a Pair Plus bet. 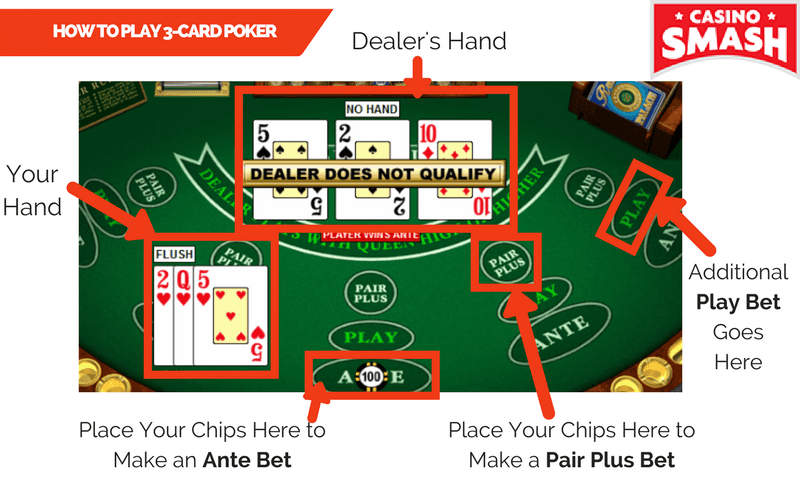 Just to recap, the Ante is the bet that your hand will beat the dealer’s, and the Pair Plus bet is where you bet that your hand will include a pair or higher. Once a bet is made, the dealer will give each participating player and himself three cards. The dealer’s cards are dealt face down. If the player made an Ante bet, then he must either fold or raise. If the player folds then he forfeits his Ante wager. If the player raises, the he must make an additional Play bet, equal to that of his Ante bet. After this, the dealer will turn over their cards. The dealer needs a queen high or better to qualify. If the dealer does not qualify then the player will win even money on the Ante bet and the Play bet will push (a tie). If the dealer does qualify then the player’s hand will be compared to that of the dealer’s hand and the higher hand wins. If the player has the higher poker hand, then the Ante and Play will both pay even money. If the dealer has the higher poker hand, then the Ante and Play will both lose. On the other hand, it the player and dealer tie, then the Ante and Play bets will push, which means you get to keep your bets! The Pair Plus wager is based on whether your three-card hand consists of a pair or better. For this bet, the hand the dealer qualifies does not matter. If your hand has a pair or better, you win. If your hand does not consist of a pair or better, you lose. If the player made the Ante bet and has a straight or higher, then the player will win the Ante Bet, regardless of the value of the dealer’s hand. The Pair Plus bet will pay based on the poker value of the player’s hand. Before you play any casino game, you should figure out the odds of each bet you make and determine, based on the house edge and payout, what decisions you should for different hands. There are also standard payouts for the Ante Bonus Payout, which depends on the table the specific game you’re playing or the rules of the casino you’ve chosen. Below you can find the payouts for five paytable variations that are popular in both online game and brick and mortar casino poker tables. Last but not least, the third three card poker bet also has its own unique payout structure depending on the hand you’re dealt. The highest payout is a whopping 40 to 1, which can mean some serious wins depending on the size of your bet of course. Whether you want to play three card poker for free, or are hunting for a juicy three card poker game to play for a real money progressive jackpot, you can find plenty of options on the following casino sites. You will also receive a welcome bonus, usually after making a first deposit, to boost your bankroll before you hit the table!